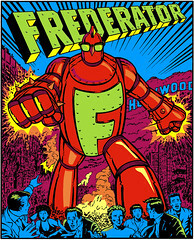 The Frederator Studios Blog: Jill Friemark. Oh Yeah! Jill Friemark's been a valued Frederator colleague for years, on ChalkZone and, most recently, on My Life as a Teenage Robot. (Check out the iconic MLaaTR poster she created in her first week on the show!) Not only was Jill nice enough to introduce us to many of her talented friends, but she came over and pitched Oh Yeah! her cartoon The Silver Spatula. Thanks for everything Jill. And thanks to Jill for kind permission to post some of her beautiful frames from The Silver Spatula. We've also been fortunate that Jill has worked on all four Frederator cartoons for Nickelodeon - Oh Yeah! Cartoons!, ChalkZone, The Fairly OddParents, and My Life as a Teenage Robot, a distinction held by (I think) just two other artists (storyboarder Bernie Petterson and storyboarder/director John Fountain). Thanks, Jill. kudos to the new tidal wave and its cool surfer girls!! Well, that was dumb of me. The Silver Spatula it is forevermore. Sorry Jill.